• + Concrete Mount Block ? 01. The headline figure of the height of the industrial structure is 60m. it is only when one drills down in the small print that it becomes apparent it is not a mere 60m. 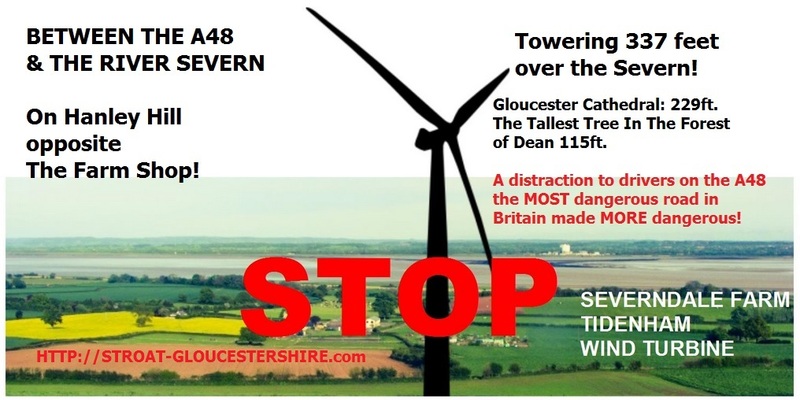 but will tower over the Severn Estuary in splendid un camouflaged isolation (until of course this precedent may be granted permitting seried ranks of them) by 337 Feet! 02. It is claimed dishonestly by the applicant that there has been public consultation – there has been absolutely no public consultation, it would seem to be that the applicant seeks to mislead the planners by alluding to a sales presentation made by themselves, to an invited audience some 3 years ago! After which the applicants withdrew their application, no doubt in the realisation they had failed to convince! A. The study has not considered the deleterious effects of their proposed industrial action to the reed beds between their proposed installation and the river, which are the gathering ground for migratory birds, which gather to feed. and thus fatten to provide the necessary energy, prior to their long migration south to warmer climes for the winter – birds which WILL be slaughtered in consequential numbers as the turbine blades smash them from the side – the report pays no cogniscience to the differences of impact at different seasons. eg the low frequency communication of elephants which can be detected over 20 miles away! C. I have been unable to trace a single solitary risk assessment of the damage done to micro organisms and their predatory food chain in soil, yet it is known that the continuous low frequency vibration radiates in the soil, causing a fall off in both micro organisms and the worms and the like that feed on them, including the larvae of the many insects on which the migratory birds are utterly dependent. The loss of such life and the vibration leads to compression of the soil and a form of soil cancer. D. I appreciate that the RSPB has made no objection nor any se4rious consideration however I would suggest that without implementation of an FoI report it would be wise to discount their input, or failure to input, as it is widely believed the Wind Turbine promoters are amongst their substantial donors! E. There would seem to be absolutely no consideration given to the impact on the many raptors in the area and even more significantly to the many owls that patrol this territory at night, with no hope of seeing the rotating blades until they are struck and killed – leading to a damaging increase in both mice and rats! F. Astonishingly the so called environmental report fails to even mention the Environmental Agency’s flood warning maps that show Severndale Farm WILL potentially be effected! 04. I also object to these plans being put forward at this time, which so redolently smacks of ‘A good time to bury bad news’! The planning application was validated on 17-Apr-2015, after Parliament had been prorogued – thus from then forward the peoples of this community were without meaningfull representation and all in the political diaspora were involved in the flux of election. We had no MP representing us until 08-May-2015 and beyond during which the new Parliament was coming to existence as a Government. We had no meaningfull Councillors as they were seeking election or re-election and even now have not been accurately listed on the web site of FoDDC. In fact I believe they have not been sworn in yet, let alone selected for the various committees – particularly planning! We are as yet unrepresented by Parish Councillors who are due to be sworn in on 20-May-2015 and the first occasion on which they can consider the matter before the, to be selec ted, planning committee is the 27-May-2015!.This is clearly a shoddy and unsatisfactory manner in which to pretend to a democratic process.I incline to believe that the application was made at this time deliberately to suit the applicant and thus I believe the Council has little option but to act with integrity and extend the period by at least the 37 days that have been lost from the 17-Apr-2015 until the 27-May-2015. Fortunately with her last two clear days the outgoing councillor Gabriella Kirkpatrick acted decisively and with integrity and at my request ‘called in the plans’. 05. I am also minded to oppose this application as, although within electoral law, the candidacy of Mrs. Maria Edwards for a council seat is of some moral turpitude as although she was standing as a Conservative Councillor she seems to have overlooked the gathering opprobrium of her own party for the siting of wind turbines on land and the stated intention of providing nil public funding for all applications that were made and not granted prior to the election. I incline to the understanding that Mrs. Edwards failed totally to make it clear to the electorate that were she elected it would prove potentially fortuitously profitable for her as the wife and thus partner in the application for the wind turbine at Severndale Farm – had she told the truth to the electorate I believe she would not have stood any chance of being elected and unseating a candidate with the community’s interests at heart! I believe Mrs. Edwards’ position to be morally repugnant and her status as being out of keeping with the very principles of democracy regardless of the fact she may declare her interests at a later stage it does appear she obtained her position by deception. 06. I appreciate that in return for the massive subsidies enjoyed by installers of this failed concept of power generation hereto fore there is a limp and implausible attempt to claim a ‘community benefit’ when quite clearly there is no meaningfull benefit gained that even begins to compensate for the damage such an industrial installation in so clearly a rural AoONB and loss of visual amenity for so many 1,000s of people, minded this edifice will be visible from Gloucester and much of South Gloucestershire and of course much of the FoD, being some 337feet high when Gloucester Cathedral is a mere 229 feet high!The pretence of a community benefit is palpably little more than an effort at justification by the applicants. much beyond the very personal member of the community and his own bank account.To justify this statement may I point out the public accounts of one of the applicants. 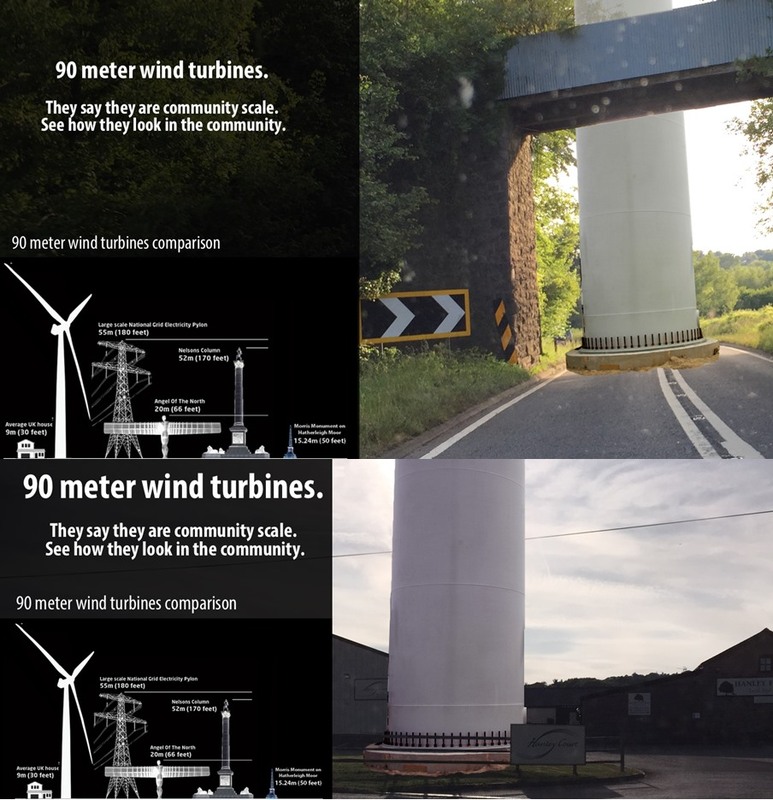 who also has a similar interest in the wind turbine at St.Briavels which values that interest of around 50% as being £500,000 – perhaps besides free/subsidised electricity for Severndale Farm the applicants could make clear the relevance to the community of the small sop they offer relative to the £! Million value of their subsidised installation with a mere 20% efficacy and thus were it 100% effective the value would doubtless be in excess of £5 Million!I regret that a pretence at a ‘Community Benefit’ seems little more than an insignificant bribe relative to the huge benefit for the applicants developing this industrial installation and the damage done to this AoONB not to mention the loss of amenity, potential health risks, damage from noise, flicker and safety lighting not to mention the visual damage resultant from this installation – bear in mind that The Forestry Commission advise me that the largest genus of tree that grows in the FoD is the Douglas Fir which in our climate grows to a height6 of just over 115 feet or one third of the height of this 337 foot wind turbine with its 158 foot blades!I do not include the value of property as it would seem that the loss of property value for possibly 100 people is of no planning significance when measured against the gain of one or two individuals – it may not be a planning issue but to any individual with one wit of morality it is a very clear issue! 07. A particular reason I am opposed to this application is both personal and public in that as a user, on a regular basis, of the A48 which besides being designated as a Roman road is recognised as the most dangerous road in Europe based, I understand, on death rate per mile in terms of vehicle miles. Minded that a principal cause of accidents is ‘distraction’ there can be no more convincing an argument against this industrial installation, being both close to the road and clearly inappropriate in such an open rural setting as it towers over the river by 337 feet and is a moving object dominant in line with such beautiful views – a half seen and even more distracting object at night with its alarm security lighting for the very many low flying light aircraft and the many helicopter flights in its immediate proximity – flights which are frequently below the height of this moving edifice. An even more dangerous object and distracting installation in the dense sea mist that frequently rolls up The Severn Estuary. 08. One should also be minded that in consideration of the Roman ruins in the immediate area it is worthy of particular note that in ajoining fields there is the platform of what is believed to be a Roman temple, also of a Roman villa there is also I understand a Roman Mansio (a Mansio being the stopping point for Roman troops distanced by the marching regime of Roman Centurions on the move) this particular Mansio was the point at which troops gathered to await the right tide when crossing the Severn south or mustering to dry out and get in good order after crossing from South Gloucestershire.It is likely that there are other features as yet undiscovered. It is also worthy of note that Hanley Hill is known to be the Moot and as such was the meeting point for residents of Tidenham and thus has both medieval and pre medieval significance. 09. It is also worthy of note that there was at one time an electricity pylon sited on Hanley Hill which was removed as it was considered unsigtly and the cabling was diverted. 11. This installation is far too close to the river, thus on the open historic flood plane and sticking out like a sore thumb and visible for miles around, this huge industrial structure, which will be over 150 feet taller than St. Mary’s Church in Lydney and 3 times the height of Nelson’s Column in London, with its related noise and visual impact is far too close to residential properties and will effect far more properties than were it situated, like most other such structures, as being in a valley many more properties are effected on a level with the structure and its visibility will be for miles around being on so prominent and open a site. 12. I also object to this and other similar applications on purely ethical grounds as there is something particularly distastefull and morally bankrupt about the funding of these ‘white elephants’ as they are part funded by taxing the poor, through their unavoidable electricity bills, and then handing the cash to landowners and the wealthy – I find this to be utterly reprehensible. 13. I am further opposed to these installations, particularly in such an inappropriate position when it is now well proven that wind turbines are not only an ecologically unsound method of generating electricity but greedy in two natural resources in short supply, namely the excess use of copper, which is an increasingly diminishing strategic resource and rare earth extracts available from only China where it is increasingly extracted utilising this scarce resource in an irresponsible manner in the manufacture of the turbines. 14. These applications should further be rejected as it is increasingly apparent that they are so inefficient that the Government finds itself in the ludicrous position of subsidising owners with taxes levied even on the poor to fund subsidies to pay owners to take their turbines off line – turbines which those very same tax payers were taxed to fund the construction of. 15. I further reject the idea of constructing this wind turbine in the light of the many 100s of truck movements that will be necessitated on the already over crowded and dangerous A48, which clearly to judge by the numerous potholes Gloucester highways can not afford to properly repair leaving the tax payer with unsound and unsafe roads and increased wear and tear, not to mention direct damage, to vehicles – indubitably a fairer and more intelligent use of subsidies than these follies as applied for. 16. I am additionally opposed to this industrial installation in the light of the inevitable need for a service road with either a 110 or 150 tonne load capacity to allow for access by heavy lift crane facilities – a service road that will require an unsightly bell mouth junction on the A48 in the proximity of Hanley Farm shop and the property of Wibdon Farm some 60 meters in extent! 17. In support of the rejection of this application I also believe that the probability that this application may prove a precedent if it is irresponsibly accepted for the erection of many more similar industrial installations despoiling the rural banks of the River Severn and its estuary and their visual amenity for its people and its visitors. 18. I am also opposed to this application on the very real danger to jobs in the area, many of which are dependent on tourism and day visitors to the area all of whom will find their enjoyment of this AoONB with its many wonderful view points debased should this and similar installations be approved, this application alone will be visible from many of the classic view points in the FoD and almost all such view points in South Gloucestershire – we have a duty of care for future generations to ensure they can enjoy the unbefouled FoD we have all enjoyed. 19. I believe that it is unprincipled to believe there is any sound motivation to grant this application funded in part by unwilling tax payers who can ill afford the subsidies to enrich a few selfish individuals. The concept of smaller investors being able to participate is debatable in that that may bring no local benefits as the investment will be open via the internet to the world at large as is the applicants fatuous petition orchestrated on the internet and accessible around the world, in the realisation that petitions are prone to abuse I understand local residents decided it would be unethical and counter productive to raise a petition, just as they have it would seem extended their encouragement to comment to local residents only. 20. It is important to note, in deciding to reject this application, the claimed green aspects of such wind turbines – firstly their justification is grounded in the widely discredited IPCC report of Al Gore & Rajendra K. Paschauri where many of the claimed supporters have requested removal of their names and the signators to exposes of the theory far outweigh the supporters in their denunciation of the IPCC Report with the leak of East Anglia dUniversity documentation encompassing some 20,000 eMails that proved beyond doubt that much of the detail in the IPCC report was downright dishonest at worst and largely unsound being based on selective use of data! Do also note that Rajendra paschauri with his close partisan associations with Tatta Industries has recently been ousted from his job and Al Gore is now soundly discredited and the report itself has been accepted in Court to be insufficiently accurate to teach as a science in schools in Britain. 21. Penultimately in considering this application it is important to accept the fact that any concept of benefit to the green carbon footprint is far outweigjhed by the enormouse level of carbon output in the production of the cement alone let alone the carbon footprint of transportation of the required other ingredients of the concrete block that will act as the mount, let alone the carbon footprint of the manufacture, fabrication and construction of the enormous industrial structure. On optimum output it will take at least 10 years to ‘repay’ the carbon cost of construction and as even the applicant’s claimed figure projects a 35% of optimum output, which can be considered optimistic as their other wind turbine at St. Briavels has an output of around 20% – thus reducing profitability to allow a mere £8,000 for so called ‘community benefit’ which was originally projected at £20,000 where £8,000 to £20,000 is likely to be the cost in lost value for any single property in its damage zone in terms of noise and loss of visual amenity and constant flicker day and night whether from sunlight or safety lighting! 22. Finally let us consider in my opposition to this application the obvious fact that if the applicant had a genuione concern for the environment, as his recent award would show in 2014 one wonders why he did not advise the competition organisers that he was on the verge of despoiling the natural beauty of the area and installing a dangerous and overbearing industrial installation 337 feet above the River Severn ajoining the already overcrowded A48 adding to the likelihood of fatalities for people and birds alike. appropriate links to supportive documentations for such a selected 100 reasons to oppose the installation can readily be provided.It is for these many and varied reasons that I oppose the application and would ask that as responsible planning authority that the applicant would seem to have a paucity of sound and proven benefits to offer to justify the application beyond narrow personal interests without ‘community benefits’ or benefits for society at large that would in any way counteract the harm done were this application to be approved, be that now or at appeal – an appeal the applicant would be likely to lose were they minded to persue a rejection, in the light of the change of policy of Her Majesty’s newly elected Government with its undeniable and clear majority – a policy change attested to both by the Minister concerned Michael Fallon prior to the election and by the party manifesto.Thus I call upon the relevant authorities to responsibly represent and uphold my opposition to this application. ← PS-13: Adrian Edwards M.Sc. C.Eng. FIET Planning Objection re: sound etc.